Heat transfer across a highly conductive Koch type interface. In many natural and industrial processes diffusion phenomena take place across disordered and wild media. Irregular interfaces of fractal type are a good tool to model such media which are believed to exhibit fractal properties. 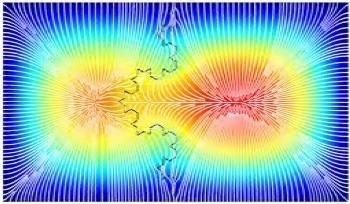 We focused on the study of fast-diffusion phenomena across irregular fractal boundaries both from a theoretical and a numerical point of view. This research is part of a long term project funded by Sapienza whose PI is M. Rosaria Lancia and it is in collaboration with the Department of Mathematics, Worcester Polytechnic Institute (MA,USA) in the context of an international agreement between ICI and WPI. It is by now well established that in many natural and industrial processes diffusion phenomena take place across disordered and wild media. We mention here only some examples, such as the diffusion of sprays in the lungs, the current flow across rough electrodes in electrochemistry and the diffusion processes in physiological membranes. 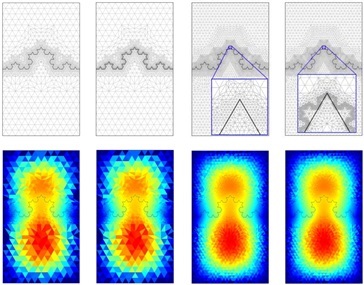 In these contexts irregular interfaces of fractal type are of great interest, since many irregular media are believed to exhibit fractal properties. Fractal interfaces, in general, can provide a useful tool in all those models in which one wants to enhance the absorption effects of the layer by increasing its surface, that is, in all those problems with large surfaces contained in small volumes. Fractals are irregular geometric objects that display self-similarity. Self-similar objects have the property to be composed, on every scale, of parts that are similar to the structure of the overall object. Many anatomic structures display fractal-like geometry, for example, arterial and venous trees, the branching of certain cardiac muscle bundles or tracheobronchial trees. Our research focuses on some fast-diffusion phenomena across irregular boundaries of fractal type. As an application we studied heat propagation problems across an infinitely thin highly conductive layer of prefractal type both from a theoretical and a numerical point of view. 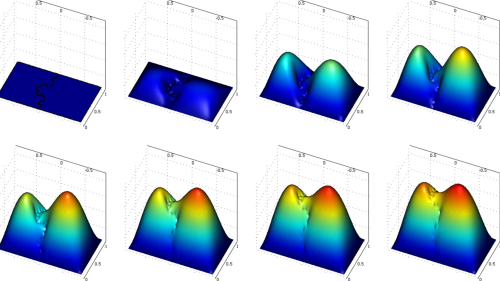 The numerical approximations of evolution problems across irregular layers are recent. We developed efficient algorithms capable to generate mesh for domains with fractals. From the point of view of applications our results may allow for the development of new generation of optimal cooling systems for electronic devices, solar panels, catalytic converters and the more challenging frontiers of nanostructural hydrophobic surfaces. It is to be pointed out that our results pave the way to another complete different fields of application, they can be regarded as a _rst preliminary step towards the study of the evolution of dendritic interfaces. Dendrites are organic cells characterized by branches which extend from the center of the cell in various directions. For instance, some cells of the human body are dendrites. The goal of our research is to model by fractal interfaces the diffusion across and along and across dendrites.